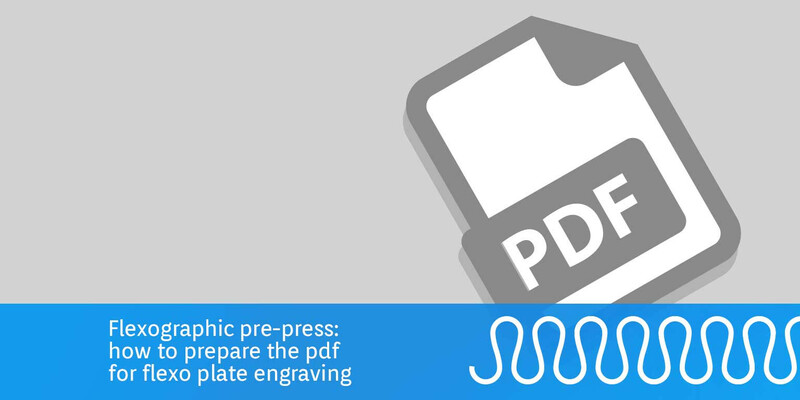 Flexo printing: guide on how to prepare a correct pdf for your plate with the online software. 1. Flexo 24 has a pre-flight software that prepares files for producing your flexo plate. ArtPro, a software distributed by Esko and designed to generate pdf files for flexo. Esko is a leading company in the creation and distribution of software and hardware in the field of flexo printing. The most popular is Adobe Illustrator by Adobe System, the mother company of the PDF file format. Unlike ArtPro, Illustrator does not have built-in tools for generating high-precision pdf files. CorelDRAW Technical Suite 2017 is a very sophisticated professional platform for creating pdf files. A free trial version is available. 2. In the pdf for flexo printing, objects and images with some tonal range are screened. The pdf file for flexo printing should be prepared correctly and accurately in order to avoid unexpected and undesirable print results. We recommend that a pdf file for flexo printing should include objects and images as vectors (converted into curves) and not rasterized. the rasterized format is made up of a series of pixels and is re-processed by the output device. If the file uploaded contains full-tone images (greyscale, CMYK or RGB), these will be screened. If the file contains full-tone images, these will be screened. Please note: RGB or LAB images will be converted into CMYK with a standard ISO Fogra39 profile, therefore print results cannot be predicted. Convert images before including them. We also recommend that the resolution of images added to pdf documents be created according to the following equation: Resolution (DPI) = LPI x 2 LPI. Screen ruling in inches used to process the plates/prints. Example. If you print at 150 LPI (60 LCM), the equation will be: 150 x 2 = 300 DPI i.e., your 1:1 image must have a 300 DPI resolution. If the LPI/DPI ratio is much higher than 0.5, the printed result will be very "blurred” because the RIP will make an interpolation of the image to obtain the missing information. Only CMYK or Pantone colors images are allowed. Before exporting, place onto the art board the images that will be rasterized at Resolution (DPI) = LPI x 2. 3. 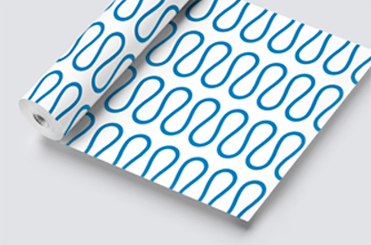 Minimum dimension of texts in the pdf files for flexo plates. According to the current regulations, the minimum size of text allowed on the smallest packages is 0.9 mm referred to the lowercase "x". This dimension is independent of the points of the font size, because every font family is different even if they have the same size in points. The dimension of the smallest text should be increased to larger than that prescribed by the current regulations if it is printed in reverse and with colour because it will tend to "close up". Printing texts in reverse with a plate thickness of 1.14 mm with UV inks on film allows very fine texts and details to be reproduced. For example, the same result is not granted by printing with a 2.84 mm thickness plate with water-based inks on paper or cardboard. This is because the liquid ink and the absorbent material together with the printing pressure generate some friction with the final substrate and cause the ink to overflow. 4. The pdf contains fonts: we recommend converting them. If your artwork contains some texts, we recommend converting them into curves before exporting the pdf to achieve reliable plate processing. In the workflow, the RIP will check the exact match of the fonts and if a match is lacking, the fonts will not be replaced and the pdf will be blocked. or, if this is not possible, with fonts converted into curves. As indicated in the post for the pre-flight software. 5. Texts and objects must be overprinted to avoid a wrong trapping and undesirable print results. 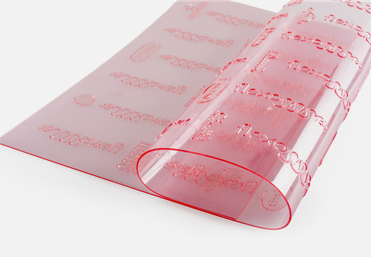 To generate the pdf files to process your flexo plates, we also recommend setting the trappings. Trappings are trims created around each color to avoid blank outlines in the event of mis-registration. According to the type of printing press and to the thickness of the plate used, the lightest colour should be extended inside the darkest colour. When possible, we recommend overprinting texts and objects onto the background to avoid mis-registration issues. 6. Imposition to increase production volume. Through the online software, you can upload pdf files up to 123 x 203 cm, 50” x 80”. Inside this area, you can include more repetitions to increase your production volume. Staggered repetitions/lanes allow a smooth cylinder rotation and avoid bumps and related unprinted areas. 7. Compensate normal plate distortion. Asymmetric scaling is useful to process a plate for flexo printing. If you know the direction the plate will be mounted onto the press drum, scaling can compensate for normal plate distortion. Scaling does not affect the size of the pages in the document, it merely changes the scale at which the pdf to upload onto online software is generated. It may be useful to use the online calculation sheet. 8. Exporting your pdf to create a flexo plate. in addition to the CMYK colors, if used. Once you have uploaded your pdf onto the configurator, the online software analysis will generate the previews with the ink/channel name. If your project does not need it, you can disable the color already when exporting: this will increase the response speed. 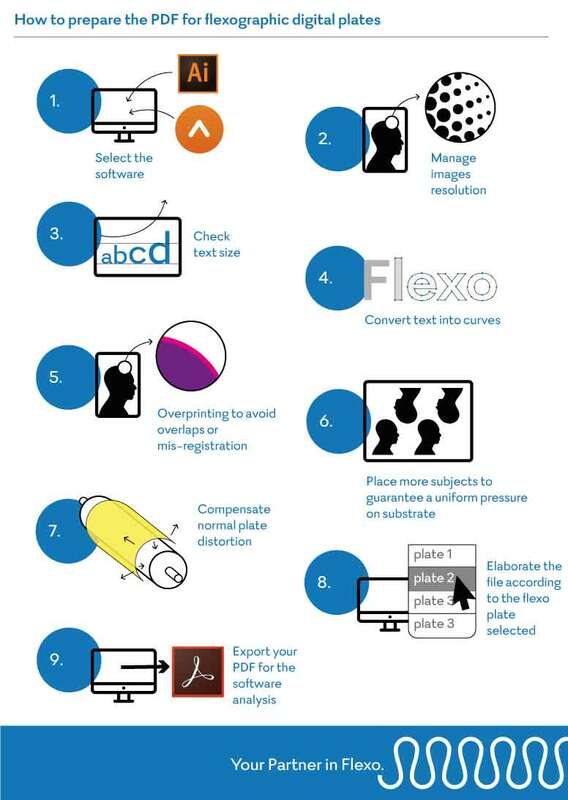 Start now and become a Flexo 24 customer: create your own plate!